It’s all out war. A territory dispute between me and a loon. The area in conflict is the patch of water between the reeds in front of our cabin. I claim it’s my swimming hole. 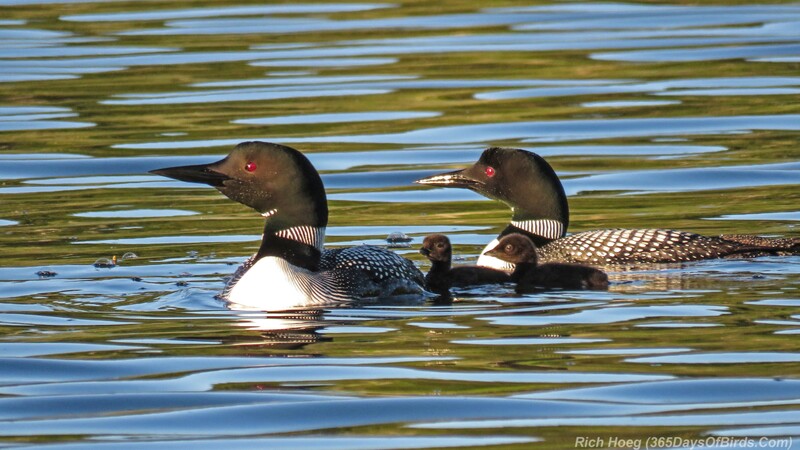 The loon insists it’s his fishing ground, and perhaps his young family’s hangout. I have history on my side. Twenty six years of morning swims. He has fright tactics on his. And they are terrifyingly effective. I’m not sure who was more surprised. Me or the loon. As I turned away from the reeds to swim another lap across the opening, the water suddenly exploded. To my immediate right the loon launched into his ritual warning dance. His eerie cries pierced the air and his displeasure was highly evident. The normally enthralling display took on a whole new perspective at close range. Far too close for comfort. Seeking to quell the nascent fury I quietly turned away, breast stroking back toward the cabin. Attempting invisibility. Looking to put distance between me and the frantic bird. But he wasn’t so easily appeased. While his antics ceased his mission persisted, and he followed me in toward shore while continuing to holler. It wasn’t until I fully conceded defeat, nearly reaching the dock that he relented. Round one to the loon. His behavior implied a baby loon in proximity. And I assumed my timing was particularly poor. So I thought little of taking a refreshing dip later in the hot afternoon. I will admit to scanning the waters for said loon or his family prior to immersing myself in the lake, but the coast was clear. The only loon in sight was well out in the middle of the lake. My laps proceeded and I regained my confidence only to have it shattered once again. Catching me on the opposite side of the channel, the loon repeated his performance. This time I knew I was a direct target, to have drawn him from such a distance. Forget the breast stroke, I made a hasty front crawl retreat with the loon in hot pursuit. Round two to the loon. It’s quite a standoff. While I refuse to admit defeat, I confess to curtailing my swimming activities. No sauna for me last night, or swim under the prolific stars. I did boldly reclaim my ground for my morning swim, but only under the watchful eyes of a dock full of family members scanning for loons. As soon as one began motoring it’s way over from a distance, they sounded the alarm. 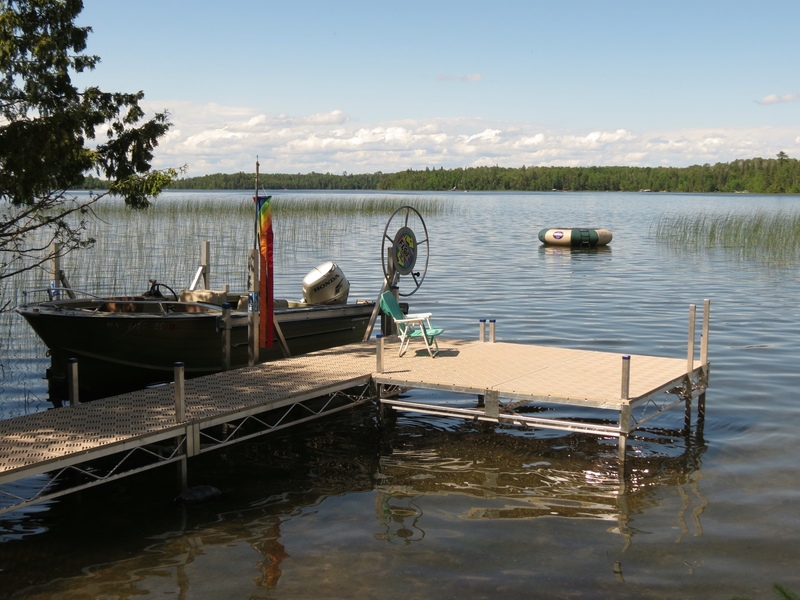 I didn’t hesitate before returning to the safety of the dock. Round three, a draw. It isn’t over yet. Swimming is my greatest love at the cabin. And I do so love the loons. Just not at the same time. 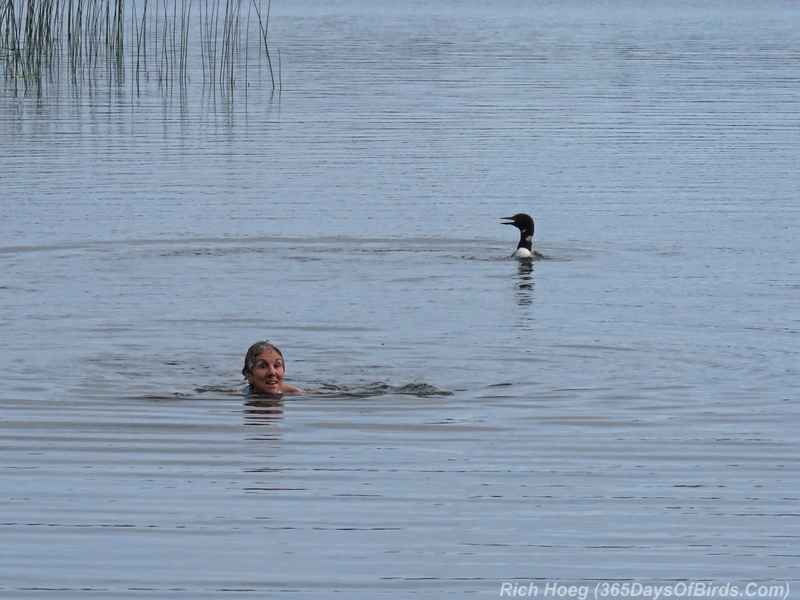 My hope is that by our next visit the baby loons will have a greater range, and they will have moved on from my swimming hole. 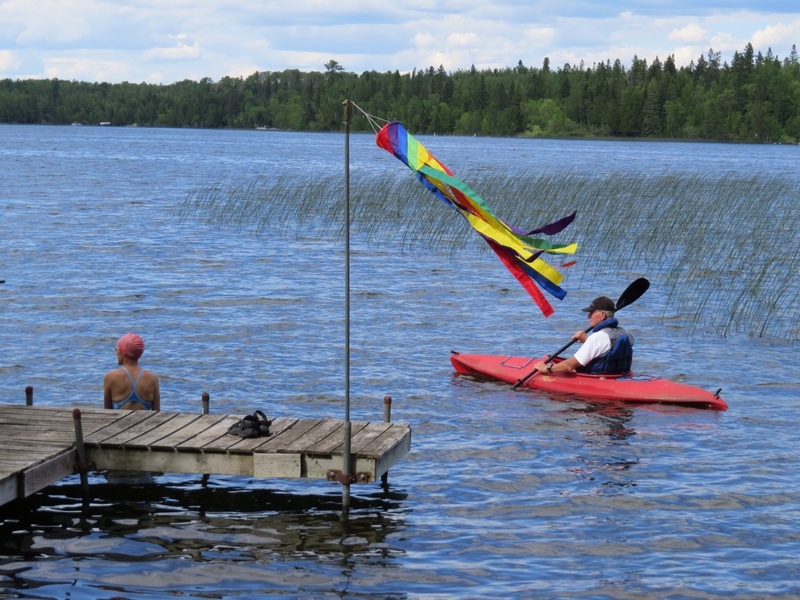 I’m not particularly fond of feuding with a loon. Sometimes you just have to let loose and take advantage of what life sends your way. With a free afternoon, and yet another day of blistering heat, when my friend Beth said she was going to a swimming hole I quickly volunteered to accompany her. Although we live across from “The Deeps” (the infamous swimming hole favored by teens) and additional river pools abound in Amity Creek and Lester River, I had never gone swimming in one. Beth took me to a spot in Lester River less than a mile from our house. Clambering down the riverside, we dumped our stuff on the warm rocks and I followed Beth into the pool. It was very shallow on one side and quickly dropped off to a deep hole on the other. I had expected frigid river water, but to my surprise it was quite warm. 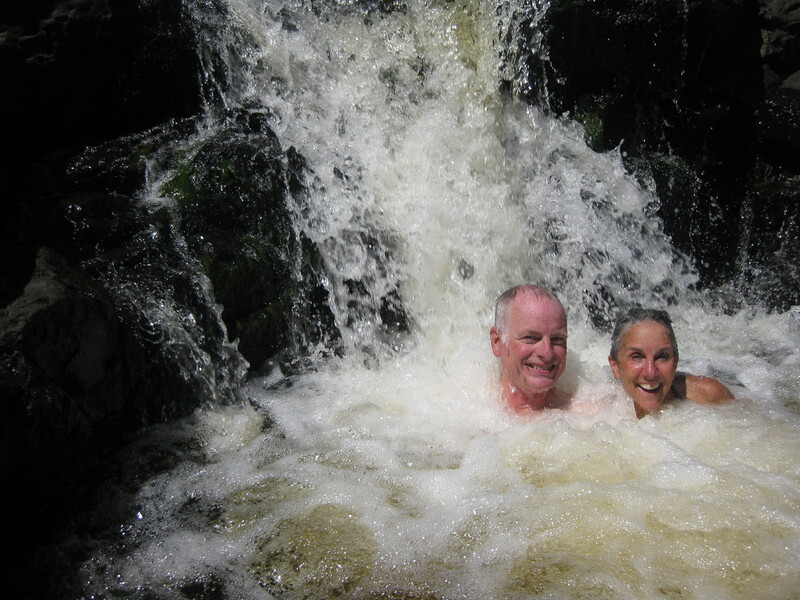 We immediately immersed ourselves in the water, which felt so good after the day’s heat. Floating on our backs, looking up into the sky through the green branches of the pine trees was heavenly. It was hard to believe we were really in a city. Moving up river from the pool, there were some rapids with shallow pools. We deposited ourselves there, waist deep in the flowing water. The hot sun actually felt good as the water swirled around us while we talked and relaxed. By the time we climbed back out of the gorge, I no longer felt hot and bothered. The river had washed all that away. During coffee hour at church this morning, I mentioned my adventure. 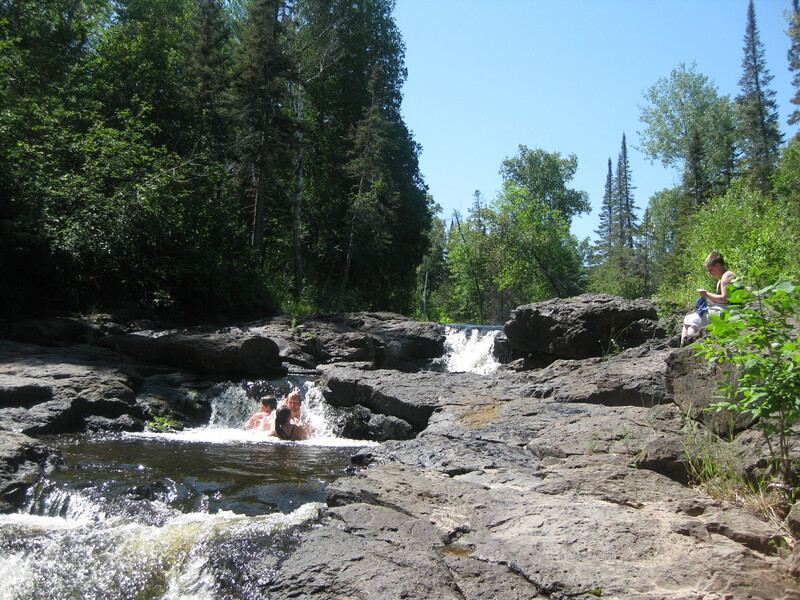 As it happens, one couple at our table lives on the Sucker River and told us about the “Jacuzzi Falls” where they like to go. 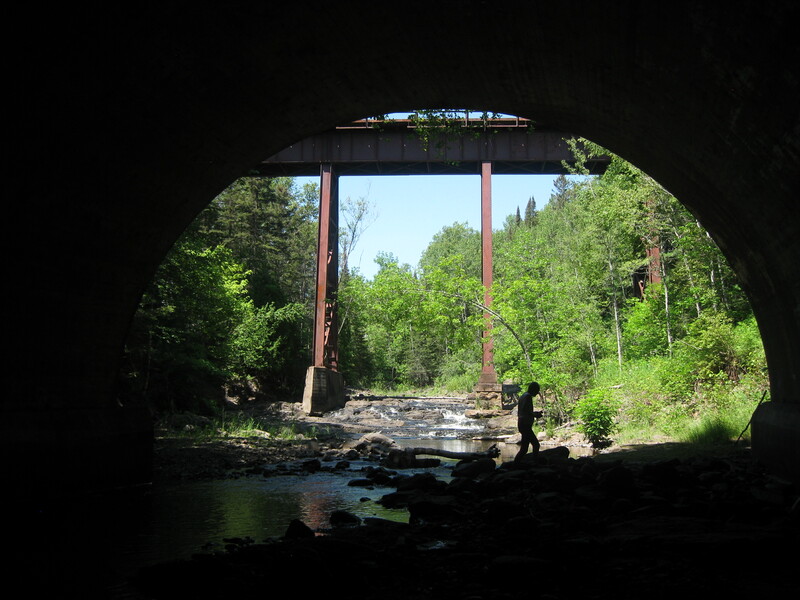 Before long, we had an invitation to join them and by early afternoon six of us were hiking up the river together. We followed the water upstream, sometimes walking the river bottom. Soaking my feet in the river felt oh, so good. Just as promised, we reached a series of small waterfalls, each with a pool below. It was a popular spot today, but we found one that was unoccupied and soon claimed it for ourselves. It too was fairly warm, making it comfortable to hang out in the water. We took turns bracing ourselves under the waterfall, letting it flow over our heads until the force of the water eventually pushed us away toward the deep center of the pool. It was the perfect respite from the day’s sweltering heat. 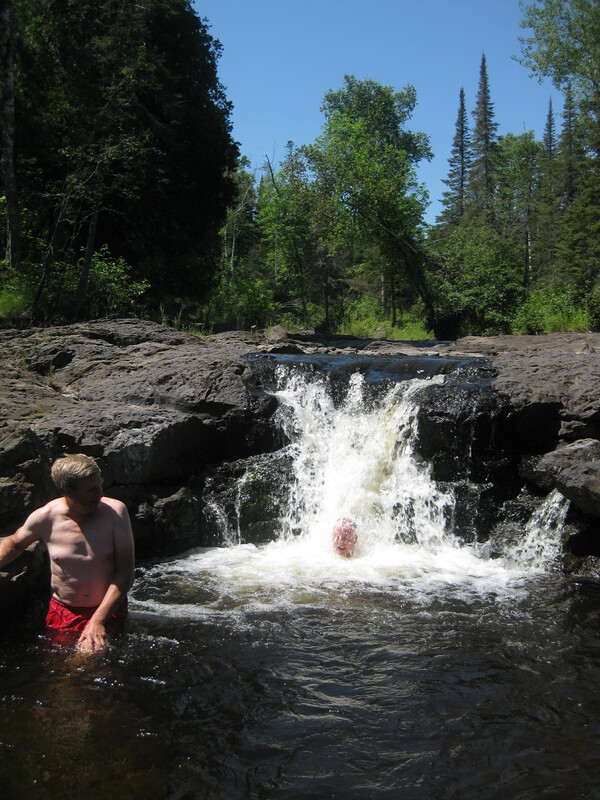 I never expected to spend two successive afternoons hanging out in a swimming hole. And yet it’s the most fun I’ve had in ages. Both were spontaneous decisions, and better than any planned activity could ever be. It was enjoyment in the purest sense, entertained by Mother Nature, shared with good friends, and good healthy outdoor activity. What could be better than that? I’m so glad I took the plunge. 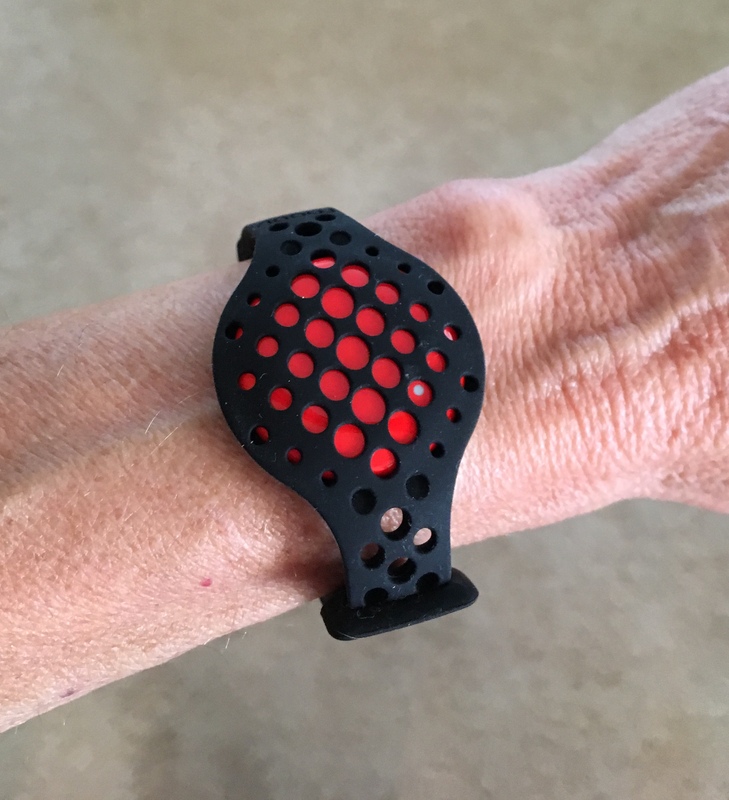 It’s all of one day since finishing my first triathlon, and as with any big race my mind keeps replaying the event and re-examining all the details. My family is probably growing weary of the topic, and hoping it will soon wear out. But I can’t resist one final post in review. One of the biggest impressions left by the event was just how well organized and orchestrated it was. 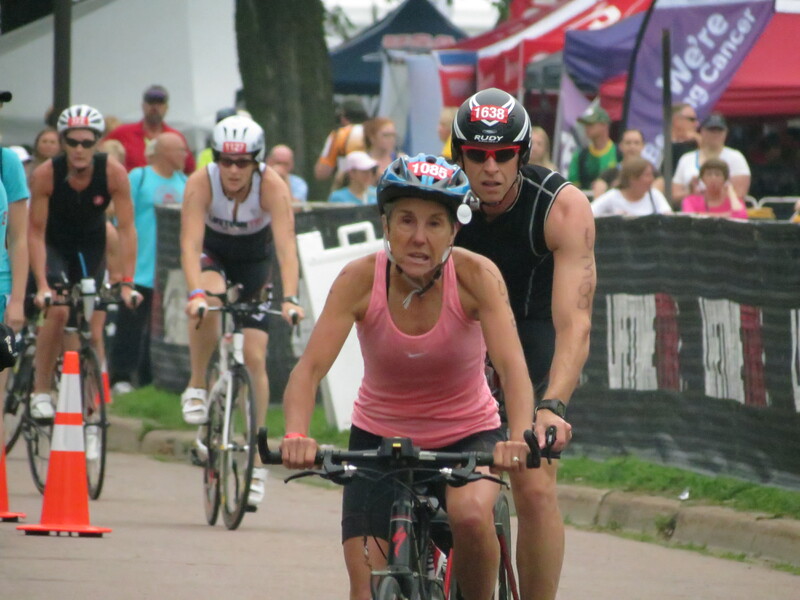 The Life Time Tri Minneapolis was a model of efficiency. And although it catered to Pro and Elite athletes, it was equally friendly to novices like me. Friends had advised me that it was a large event, and perhaps high on the scale for the athletes it attracts. And since I had chosen to skip the Sprint distance in favor of going straight to the longer International distance for my first time out, that could have been intimidating. But to the credit of the race organizers, it was exactly the opposite. The high level athletes started well in advance of my “old lady” wave, and it was great fun to hear the announcer covering their race while I waited. It was in the bike portion of the race that I was most wowed. The athletes’ meeting had prepared me for the presence of bad pavement, sharp turns, two-way traffic and potentially confusing intersections. 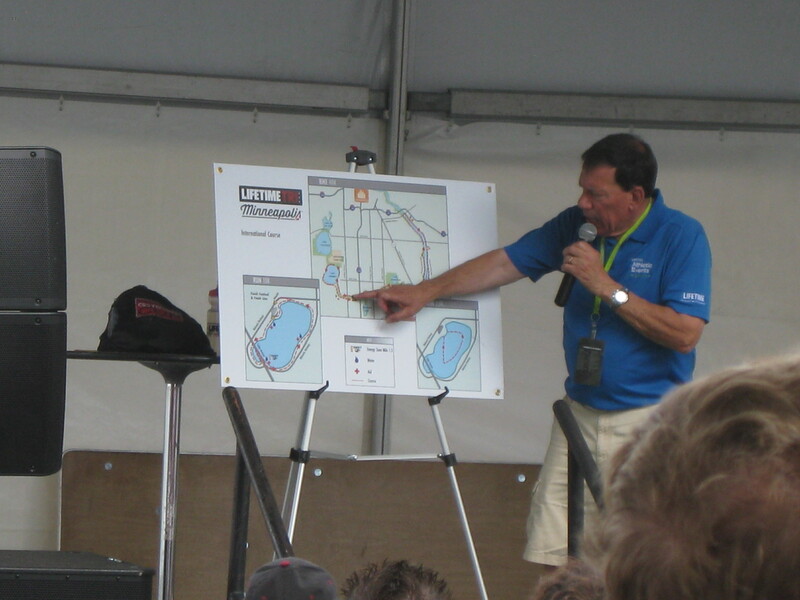 But the race was so well staffed by volunteers that it was impossible to make a mistake. I wish I could have personally thanked every single volunteer who made the event so smooth for us participants. In addition, there were signs in advance of any trouble spots warning us of what we’d find up ahead. And I always had plenty of room to maneuver on the roadways. 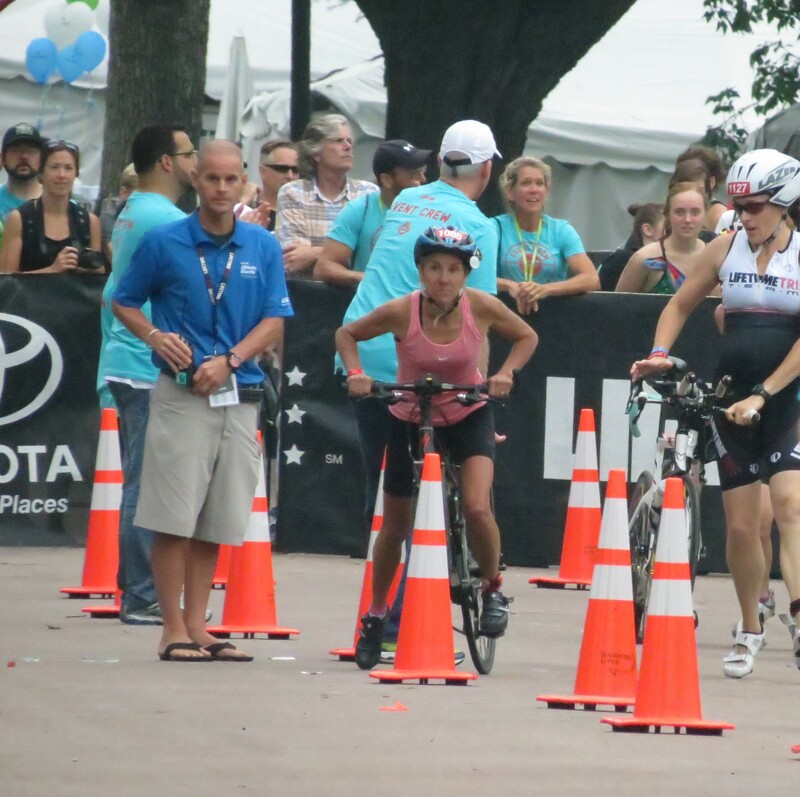 I’m convinced that choosing the Lifetime Tri for my first triathlon was a big factor in making it such a positive experience. 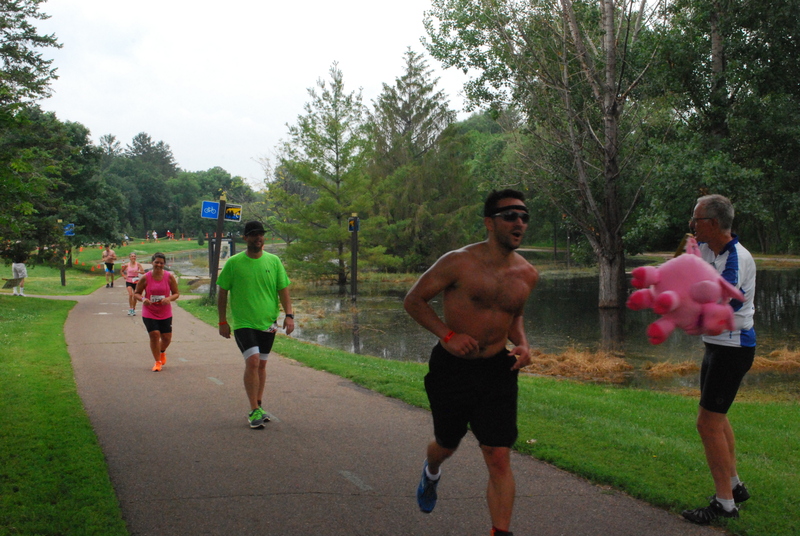 The hype and excitement of the race rivaled any marathon I’ve done – perhaps exceeded it because of the extent of the venue and on-side expo that continued during and after the race. It appears that triathlons have not yet reached the general public appeal that marathons have, with smaller cheering sections along the way. But it had other advantages for spectators like Rich and Erik who came out to cheer me on. 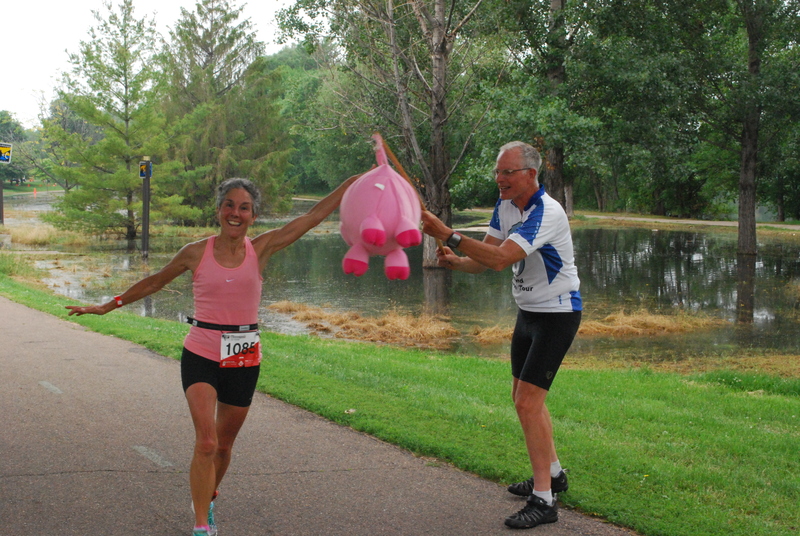 Because of the multiple sports and more compact nature of the course, they could easily position themselves at frequent intervals along my route, boosting their support power (along with the “Power of the Pig” – a story in itself…). And how did I feel afterwards? Great! 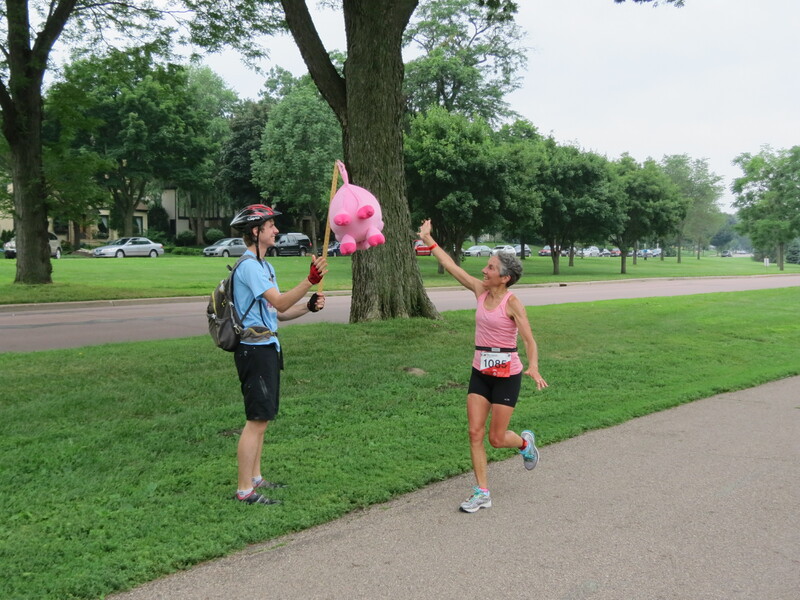 Although I pressed harder than I have in years on the final running segment and was gasping for the finish, I felt less spent than I do at the end of marathons. Or perhaps more accurately, I should say my legs were not as weary. Even though it was about 3 hours of straight competitive exercise, the variety of the sports didn’t deplete one set of muscles. But once the glow of the finish receded, once I had a good shower and my favorite post-race bagel sandwich, my body told me I was tired. Every bit as tired as after a marathon. So am I hooked? All my friends told me I would be after this first triathlon. I’m not sure. 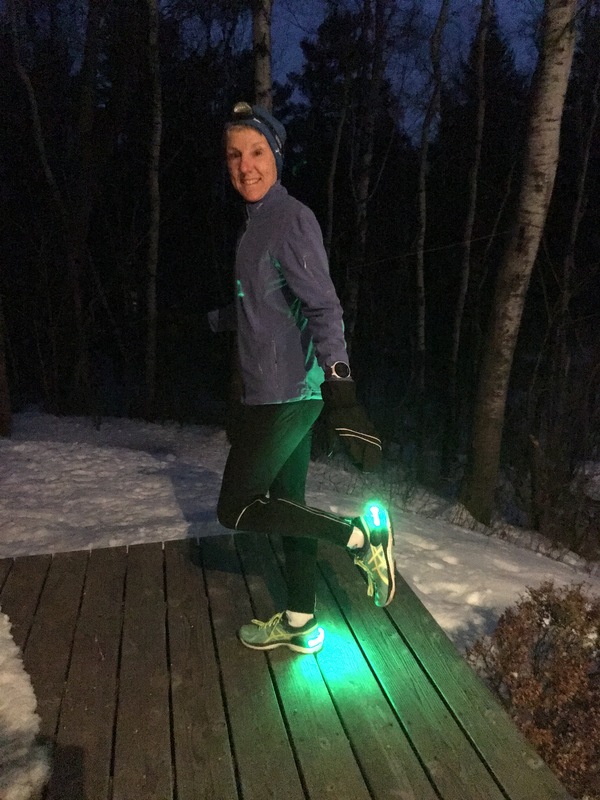 As I wrestled with the preparations and unknowns of the race beforehand, I thought that this was going to be a “bucket list” event I could cross off. But now I don’t know. There are all the usual temptations. Now I understand how it all works and could certainly improve on the pieces with little effort. Next year I will be in an even older age bracket – which always works to advantage. And it was just plain fun. Stay tuned. I’ll have to muse on this a while longer. Tomorrow’s the day. 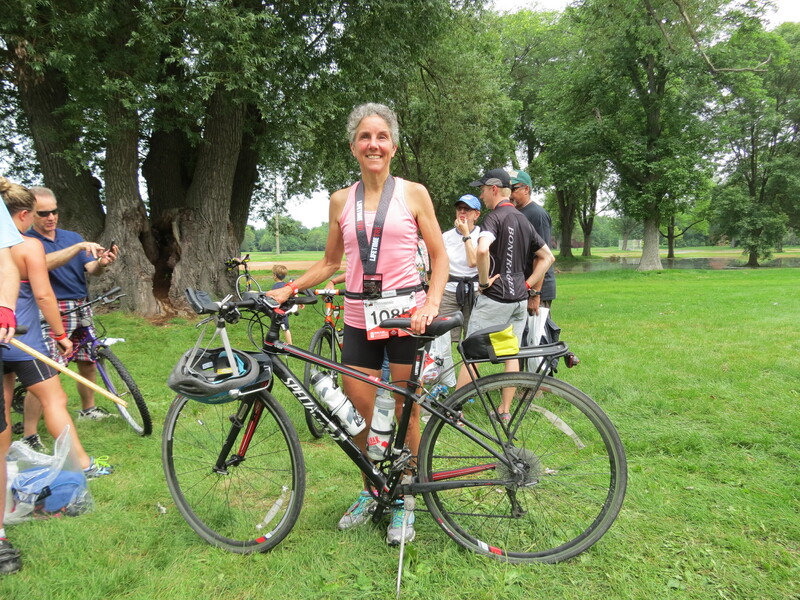 My first triathlon. I’ve done a decent amount of training. I’ve figured out what to wear. I’ve planned my transitions. And I’m really nervous. Since it’s a race involving not one but three sports, perhaps I’m justified in being three times as worried. 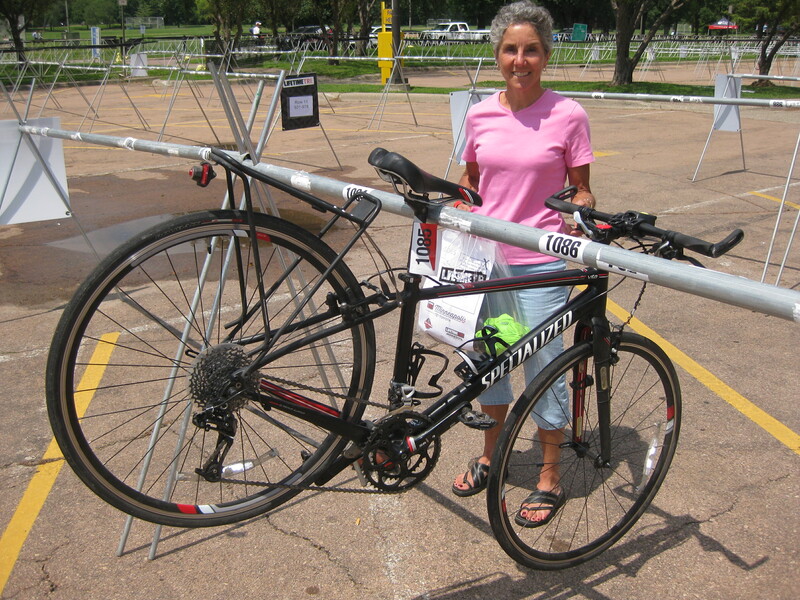 I went to the Lifetime Fitness Triathlon Expo this afternoon. There I got my race packet and goodies, picked up my t-shirt, and tested my chip. 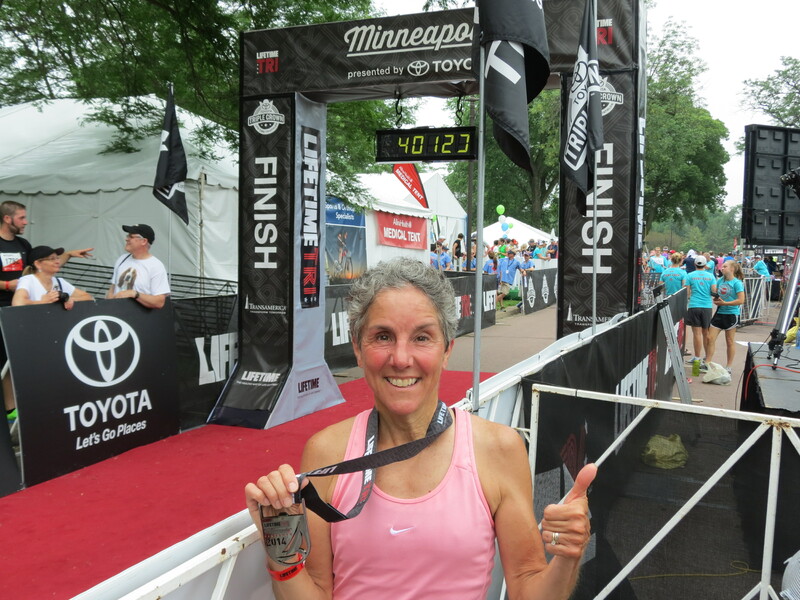 So far so good – all that is familiar from marathons and other running races. It did feel a little strange wheeling my bike into the registration tent, however. But what else was I to do with it? My next stop was the transition area. I decided it was a good idea to take advantage of the opportunity to drop off my bike a day in advance. Just one less thing to worry about in the wee hours of the morning when I arrive for the race. There was no need to hunt for a prime spot, it’s all pre-assigned by race number. The area seemed ominously empty. I hoped it wasn’t because others felt it was not such a good idea to abandon a critical piece of equipment overnight. Once I found my spot, I discovered that my small bike didn’t exactly fit well onto the rack. In fact, once I balanced my seat on the bar, the bike was swinging freely in the breeze. It didn’t even come close to touching the ground. Ugh. For now, it’s firmly anchored by my bike lock. We’ll see what happens tomorrow when I liberate it. Normally I might have lingered at the Expo to take in some of the booths. 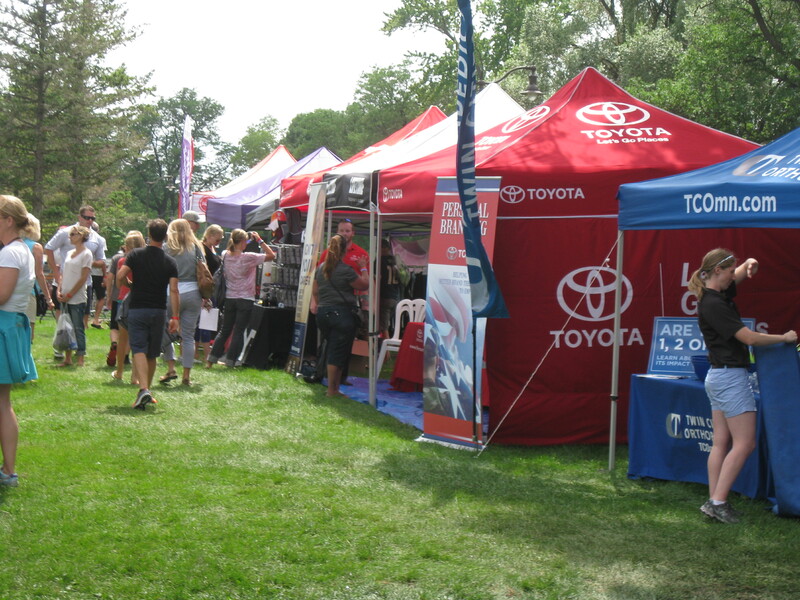 There were plenty of specialty companies catering to this audience of tri-athletes. But the afternoon was waning and it was time to head home. 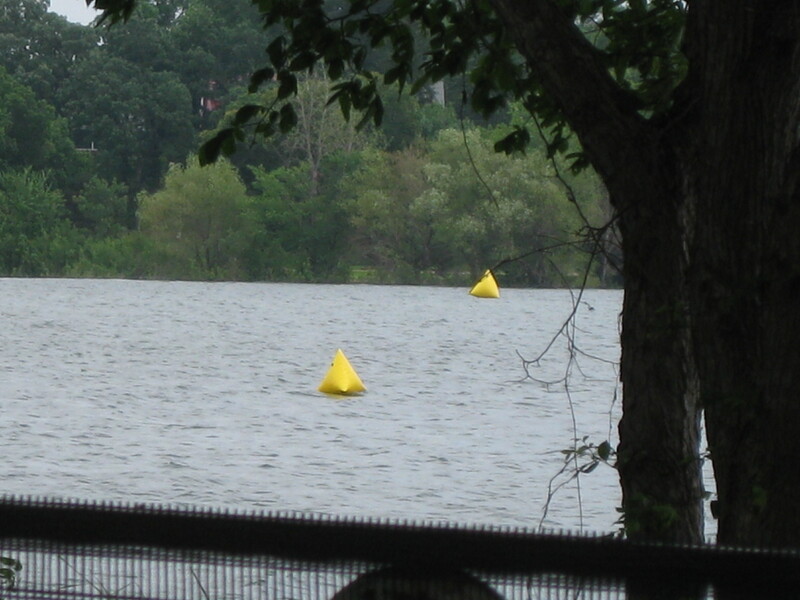 I did take a look at the lake where they were busy setting up the buoys for the swim, but it was my head that was swimming by that point. I thought I my mind would be more at ease by now. Coming home and sorting through my gear, packing my transition bag and laying out tomorrow’s clothes helped. And I’ve had my fill of pre-race spaghetti dinner. All that remains now is to get a reasonable night’s sleep and show up for the race tomorrow. Then it will be time to leave all these tribulations behind and just do it! It’s been hanging over my head all week. Ever since getting to the cabin I’ve been peering out at the lake knowing I was going to have to tackle it. I needed to do an open water swim. But I was also nervous. 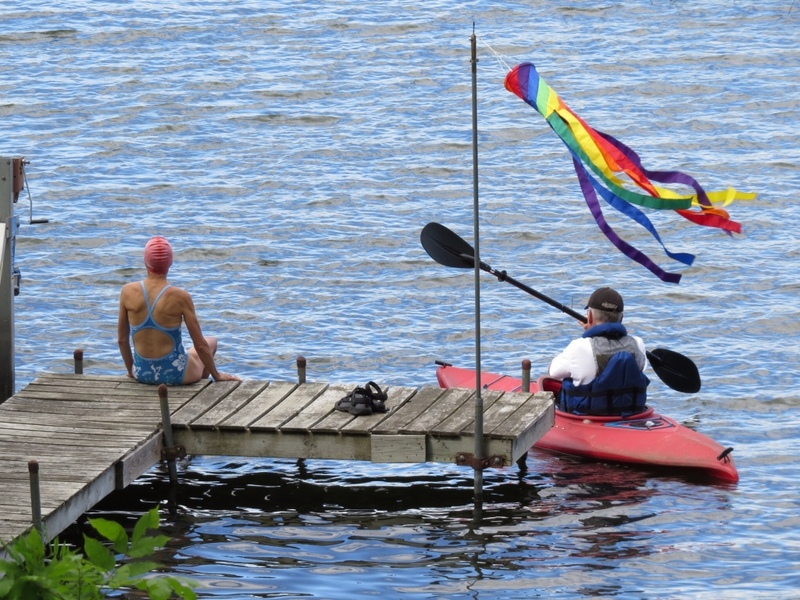 It didn’t help that my son, Erik, and his girlfriend, Katie, who I consider to be hardy youth, reported that the lake was “really cold” and declined to swim. First the wind and the waves provided an excuse. Too wavy to swim. Too cold. Too cloudy. (Too scared, really.) But then came a relatively calm and sunny afternoon. I knew my options were dwindling, screwed up my courage and recruited Rich to come out in the kayak as my safety boat. Too late to back out now – I had to do it. Surprisingly, the water was quite swimmable. It was brisk to be sure, but I’ve suffered worse in that lake. It felt strange to be wearing a swim cap and goggles – something I never do in the lake – and I tried to ignore the now-visible weeds as I passed over them. It’s really better not knowing. At first it seemed like the distance was insurmountable. I needed to do .93 miles to mimic the triathlon distance. I had thought that swimming to the campground beach and back would be enough, but it turned out I needed to swim even beyond that. Not a good feeling. But as I fell into the rhythm of my strokes and relied on my long distance lap swimming, I felt as though I could manage it. Staying on course was tricky, and I had to figure out how to lift my head to peer out and spot my destination up ahead. It definitely was a disruption to the cadences of my swimming. I’m sure there are tricks to doing it more efficiently. In addition, I already knew that I had a tendency to drift left when I swim. Rich tried to counter that by yelling “Point!” to try and curb my corkscrew curves. I do so hope they have some bright bouys in the race to help keep me in line. The waves proved to be a challenge, as I expected. 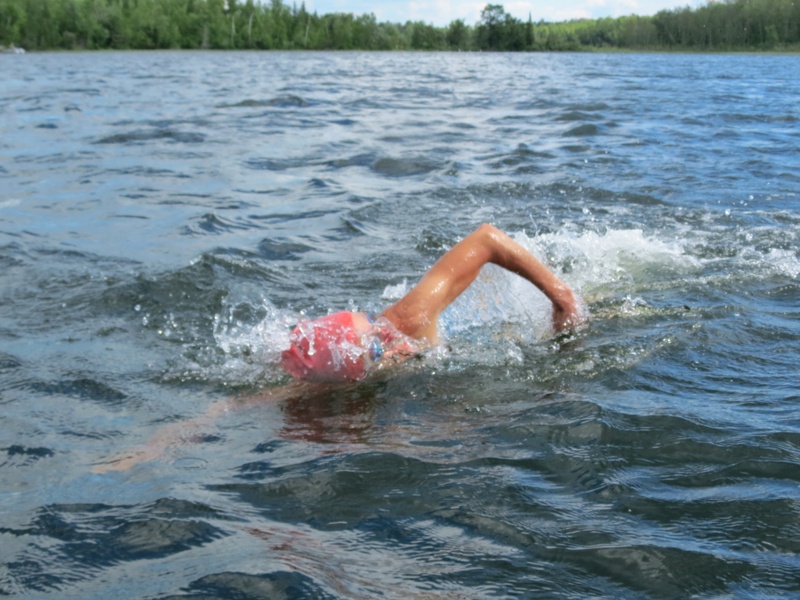 I was swimming into a mild quartering headwind on the way out, with the waves hitting my breathing side. I know I should be able to breath equally well on both sides, but I’ve never pursued that. Now I get why it’s important. But I survived. And turning around to swim with the waves was sweet! My biggest fear was succumbing to the cold of the water, getting too chilled to swim effectively. But even with my skinny body, I was able to retain enough body heat to swim comfortably. The whole way. Yea! If I could handle North Star Lake’s cold, I should have no problem in Lake Nokomis. Completing that swim was a huge boost to my confidence. I now know I can do it. I was even more pleased to learn that it was only 5 minutes over my pace in the pool – not bad for all the extra obstacles I figure. Of course, I was all alone out there. No other swimming bodies to dodge or churning water to navigate. I will leave that for race day. At least I’ve conquered the open water.